The emotions of wanting Paige Toons NEW BOOK! I'm going through that stage at the minute where a new book is soon being released and I need to get it out! (Okay that sounds awkward to explain further and gosh knows what thoughts are going through your heads right now) but moving on.. I'm at that stage where, you know that stage... it's coming up to a new book release by one of your favourite authors and you start seeing other people post pictures that THEY HAVE THE BOOK and you want to have the platonic and mature attitude and be like "aw that's fab hope you enjoy it" OR "aw that's great!" But you can't because they have the book.. that book! THE ONE you WANT! THE ONE you NEED, THE ONE you CAN'T LIVE WITHOUT! It's not fair.. I feel like I wanna cry everytime someone else shares that they have it or I wanna throw stuff.. yeah throwing stuff feels like a better coping method! It's released next Thursday but it bugs me, why can't we all receive it at the same time.. preferably me before everyone else! Please can we just stop this? I'm gonna cry.. people are making me cry! Can we take everyones copies away until I have it and I have read it then the world will be sunshine and roses again? I feel like I've said everything I need to and now it's like.. I feel deflated, heartbroken and sad! But most of all disappointed because well I don't know why I just wanted to add that big word in for.. effects or something! I may sound slightly unhinged or a bit.. crazy although I'm not! (Though some will argue that point, (family ofcourse) that was like bracket inside a bracket!) That's like super cool right now. I just needed to vent about my bookish emotions right now because I need that book! I have came to the decision that I will NOT be searching The Sun in Her Eyes on twitter, instagram or Facebook till I have my copy! I need chocolate now.. Check out my fanpage for the author on Facebook: (I'm slightly obsessed with her writing.. us bookish people are enthusiastic!) Just click on the image! Is there an authors books who make you a little hyper when its close to release? 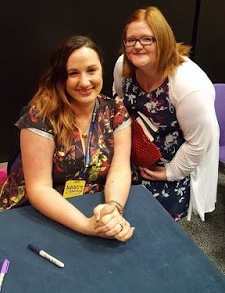 I get like this with Paige Toon and Jennifer L. Armentrout! 10 Reasons Why You Should Read Tiffany Reisz!